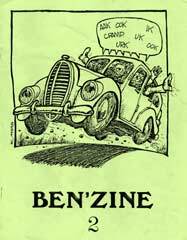 Ben'Zine was my attempt to put what I liked about Cons into fanzines. It included articles and artwork from friends, many of whom I met at conventions. But what turned me into a fanzine fan was a week in Wisconsin. It started in late 1976 when I offered to put Jon and Joni Stopa's book/magazine collection into order. It was a one or two day job but it took me a week because I got sidetracked a lot. 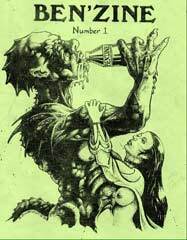 First it was by the pulp prozines like Astounding and Startling Stories. Then it was the letters in the pulps; the flights of fantasy in the lettercols were often as wild and creative as the prose. A few references within the letters to fanzines piqued my interest and on another shelf I saw piles of stapled pages with some of those titles. Luckily for me the top two issues were Cry and Hyphen. Five days later I felt like I had a lot of new friends like the Walt and Madelaine Willis, Bosh, Goon Bleary, Atom, the Busbys, Wally Weber, and in the newer ones wonderful people I had already met at conventions, like Bill Bowers, Leah Zeldes, Ken Fletcher, Denny Lien, Mark Riley and Mike Glicksohn, to name only a very few. So within that week I learned the joys of several fandoms and got the itch to see if I could join in. Then one night a month or so later I just could not get a 'fan history' story out of my mind, so I sat down and wrote "The Weird Tail of Spayed Gerbil Fandom". So now I had an article, I realized that I had to put together the rest of a fanzine to go around it. The next few conventions (and in those days there was nearly one a week in the Midwest) I asked friends to contribute. Then I asked again, and again, and again. And the following Spring Ben'Zine 1 was born. It was followed, not very quickly, by #2 and even later, #3. There was a long interval (when I was overseas most of the time) until in the early 1990's I had the time and energy to put out B'Z 4 and 5. I had a great time doing it and I hope you have a as good a time reading them. As always, LOCs are welcome.